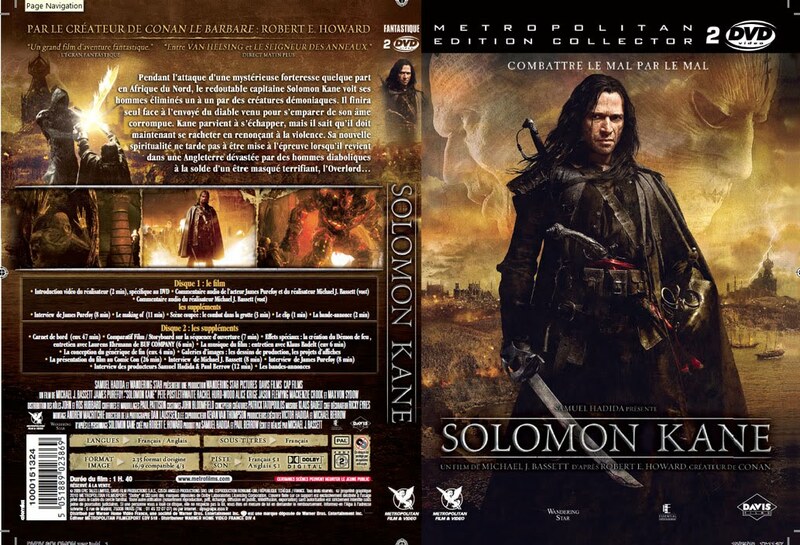 I was also told that Solomon Kane was the number one selling Blu Ray and DVD in the UK on the day of its release. We beat out The Lovely Bones, which is nice, since that beat us at the cinemas. Well done everyone involved. I've ordered the DVD from Amazon, and intend on reviewing it as soon as I get my grubby mits on it. It'll be interesting to see if my original thoughts apply, or if it's better/worse than I remember. Obviously, the two commentaries are essential: I really want to hear what Bassett & Purefoy have to say about not only the shoot, but anything relating to the original stories & Robert E. Howard. Bassett's introduction, the Making Of, and the interviews also look very interesting. I might actually shell out for the Blu-Ray and borrow my cousin's Playstation 3 to watch it in glorious high definition. I still hate the cover, though. Ach, that over-saturated yellow and red, the sound-bytes from third-rate review sources, that damn tagline... Why couldn't we get something like the French cover? Damn you Miguel, you get the cool one. Yet another case of France kicking the UK's arse when it comes to Robert E. Howard. OK, it still has the horrible tagline, and it has the daft fire demon in the screengrabs, but it still looks so much classier: a muted, sombre, natural colour scheme, no silly sound-bytes, the screengrabs are more tastefully arranged, plus they have Robert E. Howard's name on the top of the back of the box. I might just get a high-quality print out and put that over my copy. Stupid UK DVD designers. EDIT: And would you belive, only a few hours after making this post, my copy arrives in the mail! A review will be forthcoming. With other DVDs (usually for TV series like Space:1999, Doctor Who and Star Trek,) fans have made their own sleeve art and posted them on the internet, for others who hate the originals to download and use. A buddy of mine has all the Doctor Who and Real Trek DVDs with fan-made (and MUCH better) sleeve art cases. Looks awesomesauce on the shelf! Perhaps a design looking like an old, leather-bound book, or using some Gary Gianni art/backgrounds would help. Awesome ideas, Tex: any recommendations for where to find them? 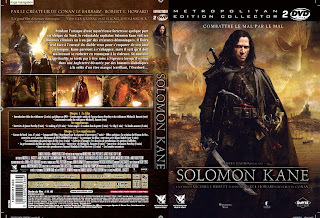 I might just do my own Solomon Kane cover: I'll probably be doing one for my "Howardian Edition" outline anyway. I haven't found any REH fan-made DVD covers (yet.) I'm keeping my eyes peeled. You will, I hope, show us any work you do on a Solomon Kane cover? Even if you did it while stone-blind paralytic drunk (hic,) it would have to be better than the Last of the Mohicans rip and grungy-video-game ones above. theres a few here, how one downloads them, isnt immediatley obvious though . . . Cheers, Gerry! Some nice choices there. No idea how to download them, though. A mystery!